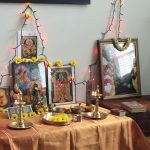 The Bhagawatha Saptaham was begun on November 11th and concluded on November 17, 2009 in Pewaukee, Wisconsin. Sri Ramanujamji conducted the lecture sessions by starting each day’s proceedings with the Dhyana slokam followed by Mahamantra chanting. The lecture sessions were well attended on all the days and there was overwhelming support from the temple management. Sri Ramanujamji explained the significance and importance of Srimad Bhagawatham which is the quintessence of Bhakti and Vedanta. All the upanishads and teachings of Bhagawan Shri Krishna in the Bhagawad Gita are very beautifully contained in this great purana. 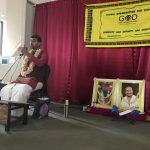 Then he talked about the discourse of Sutha Pouranika with Parikshit to answer the two questions – a) what one should do in this world all the time and b) what one should do towards the end of life? As much as there are 18000 verses and several chapters in the Srimad Bhagawatham, Sri Ramanujamji mentioned that in this Maha Yagnam he will be talking about the following tales as they are very appropriate in present day context. Chanting of God’s name brings forth so much peace and bliss to troubled and tensed minds. Ajamila was rescued from the jaws of death through his involuntary invocation of Lord’s name ‘Narayana’. The greatness with nama chanting is that it can be uttered any time, anywhere, and is simple and easy to understand. Practice of presence of God in everything we do brings us closer to the true self. The God depicted as ‘ajayamano bahuda vijayate’ brings home the point that God is full of effulgence and is ever present. 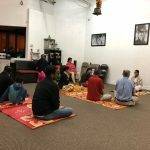 The rasikas and devotees were treated to the excellent tale of Dhruva extolling the values of doing bhakti, tapas and meditation. Bringing the one pointedness in our thoughts, word, and deed towards understanding God was very concisely explained by Sri Ramanujamji. 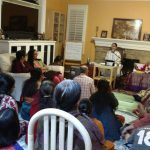 In this session, Sri Ramanujamji talked about how one should approach God with humility and love. Kuchela , poor Brahmin, an ardent devotee of Shri Krishna sought the grace and darshan of Shri Krishna in a selfless manner and attained Vaikunta by virtue of his bhakti and prema bhava towards the Lord. The final day saw the experiences of Rukmini Devi who was seeking Shri Krishna as her consort. The tale goes on with her spiritual sadhana, her boundless love for the Lord, and how He hears her prayers and decides to come to her place to marry her. Each of the charitram was very descriptively narrated with the help of experiences of mahatma purushas like Shri Vallabhacharya, Sant Kabirdas, Chaitanya Mahaprabhu, Mirabhai, Sant Thukaram, Yogi Ramsuratkumar, Bhagawan Ramana Maharishi. The devotees looked forward for more satsangs.